All ISHMPR members were invited to join us for this year’s Fall Conference at the Hard Rock Hotel in Chicago, IL. On November 2 & 3, the conference allowed members to learn what is new in the healthcare marketing field, visit with exhibitors and network with their peers. The Pinnacle Awards dinner celebration was held in conjunction with the conference, where winners were announced. The 2017 Pinnacle Awards ceremony took place during the Fall Conference. 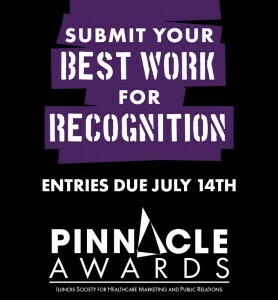 ISHMPR created the Pinnacle Awards Program to recognize its members for the challenging, creative work they do on a daily basis and to recognize excellence in clear and effective marketing and public relations communication. All ISHMPR members were eligible to submit their marketing team’s work for recognition in a variety of design and strategy categories.